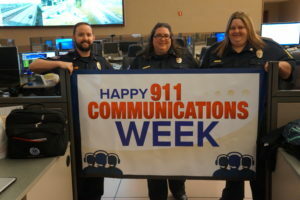 The East Baton Rouge Parish 911 center is staffed by EMS employees that are APCO trained as well as either EMT or Paramedic providers. There are 40 Emergency Communications Operators divided over four 12 hour shifts. Last year the center answered over 427,000 calls for an average of 1,200 911 calls per day. The 2017 APCO Communications Team of the year award was given to East Baton Rouge Parish EMS Communications on August 14, 2017. In early July 2016 the Communications staff worked long hours due to protest in the wake of a shooting by a police officer. Then on July 17th just as staffing return to normal levels, the exhausted team was suddenly back on alert. Six Baton Rouge law enforcement officers were shot, three fatal, by an angry citizen. From the moment the initial call came in the team was in all hands on deck mode, and they remained in constant motion throughout the incident. The team remained calm while hearing officers shouting for assistance over the inter-op channels. No one gave up, broke down, or walked out. The team was dedicated to taking care of the community, and stayed strong until the job was done. Less than a month after the police shootings, in August 2016, Baton Rouge suffered mass flooding due to a stationary low pressure system. The system dumped over 20 inches of rain in the Baton Rouge area causing nearly a third of the city to flood. Despite many of our own employees losing their homes, they still came to work every shift and continued to help others in need.